Digital Acla builds effective, affordable Web sites for small and medium sized businesses, both here in Ireland and worldwide. We combine Web design, copywriting and search engine marketing to make Web sites that work harder for our clients. An ecommerce site with secure online purchasing. ROI (return on investment) exceeded 100% within six months. This ecommerce site was launched in autumn 2001. Within six months, gross sales had exceeded the full development and maintenance costs of the site. A fast-loading, easily navigable site that performs very well in the search engine rankings, Achill Knitwear has been a real success for its owner. 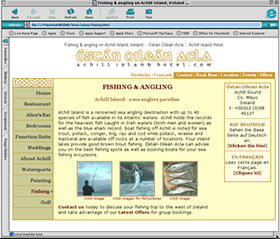 The site was enhanced in summer 2002 with the addition of a search facility and a 'recommend a friend' function. It currently attracts about 2,000 visitors a month. A multi-lingual Web site that includes a remote content management facility for easy updating of events listings and special offers. This site for a local hotel, restaurant and conference centre features content in English, French and German. Translations were managed by Digital Acla. The site also features a remote content management facility that allows hotel staff to add details of forthcoming events or special offers via a simple Web interface. Photography for the site was provided by Digital Acla, including a large number of Achill scenes. 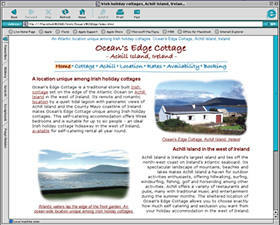 A 'brochure ware' site for a traditional Irish cottage available for holiday rental. This site features a simple, effective layout with white space used to frame the photography that really sells the product. As well as an attractive presentation of the cottage, the site works hard to achieve good search engine rankings for relevant keywords. It has consistently held top two positions on Google for the phrase 'Irish cottages to rent', for instance, and currently attracts targeted traffic of over 1,000 unique visits a month. In November 2002, Digital Acla launched Business-Gifts-Supplier.co.uk, a new e-commerce site offering corporate gifts and merchandise to UK and international business customers and individual consumers.